The process of inflammation is highly complex and is defined as the body’s reaction to physical, chemical or biological injury, which in a normal healthy individual, results in the localization of the problem and regeneration or repair of the damaged tissue. Unfortunately, inflammatory response is not always beneficial to the individual. A prime example is that of osteoarthritis, an inflammatory disease which can effect all the bone joints of the human body but primarily affects the “wear and tear” joints of the feet, knees, hands, hips, shoulders, elbows and back which have usually had the effects of many years of work and sometimes injury. In certain circumstances, the process itself can cause damage and injury. The autoimmune disease, rheumatoid arthritis, where the body attacks itself, and the hypersensitive states leading to asthma and anaphylactic shock, are examples of uncontrolled inflammatory responses. Initiation and control of the inflammatory process is complex and governed by an array of biomolecular mechanisms. One important pro-inflammatory mechanism is closely associated with cell membrane bound arachidonic acid, which becomes converted into other compounds in the body that are potent inflammation-supporting substances. • The cyclo-oxygenase pathway, which leads to the formation of prostaglandins and thromboxanes. Many of the products of these pathways have potent inflammation-supporting properties. For instance, LTB 4 is a potent chemotactic agent capable of attracting large numbers of leucocytes (white blood cells), to the site of the injury. LTC 4, LTD 4, and LTE 4, which are metabolites of LTB 4, are potent bronchoconstricting agents and were formerly identified as SRS-A’s (slow reacting substance of anaphylaxis), a key factor in anaphylactic shock. 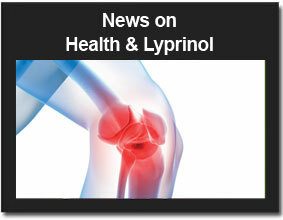 Currently used anti-inflammatory drugs function mainly by inhibiting the cyclo- oxygenase pathway. In view of the important functions of the inflammatory process ascribed to the lipoxygenase pathway, there has been considerable scientific effort to develop a 5-lipoxygenase pathway inhibitor over the past decade. 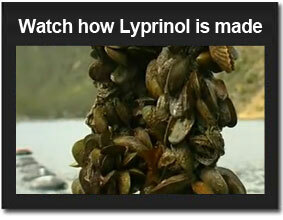 Lyprinol® is a 5- lipoxygenase pathway inhibitor which is both effective and safe.